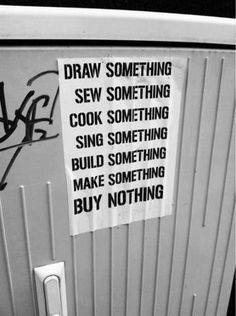 Buy Nothing Day (BND) is an international day of protest against consumerism. In North America, Buy Nothing Day is held on the Friday after U.S. Thanksgiving; elsewhere, it is held the following day, which is the last Saturday in November. The first Buy Nothing Day was organized in Canada in September 1992 “as a day for society to examine the issue of over-consumption.” In 1997, it was moved to the Friday after American Thanksgiving, also called “Black Friday”, which is one of the ten busiest shopping days in the United States. Soon, campaigns started appearing in the United States, the United Kingdom, Israel, Austria, Germany, New Zealand, Japan, the Netherlands, France, and Norway. Participation now includes more than 65 nations. This entry was posted in INSPIRATIONAL MESSAGES AND QUOTES and tagged society. Bookmark the permalink.